While working on the Prairie Thunder book, I came upon this coiled rattlesnake, who thankfully gave me plenty of warning. I made a few images with a long lens before we came to an understanding - I would need to back off. The snake slithered safely into the prairie grass, a magnificent creature just needing a little space. Stan warned us all to watch for snakes. 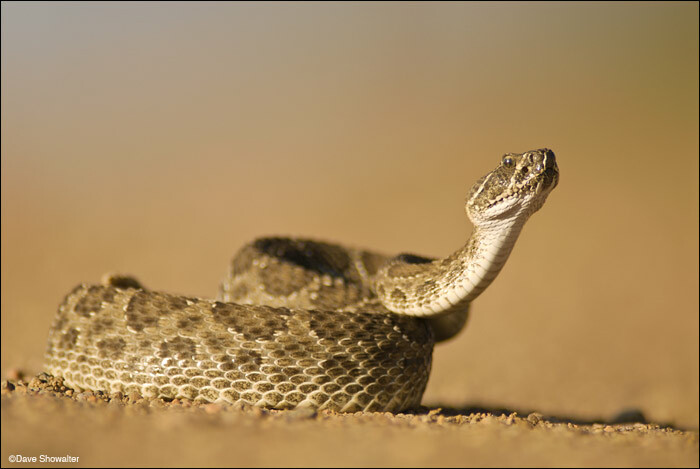 Half an hour later, I found myself with a pissed off, coiled rattlesnake (like the one pictured here) between my legs. He gave no warning and I wasn’t watching for snakes as I was told, just walking around, looking around. The sound of the snake triggered a visceral fear and the response was some sort of hillbilly jig and a leap that may have broken a long jump record. I’m pretty sure the snake nailed my boot and I know I’m very lucky considering the nearest hospital was probably an hour away. I was working at TNC’s Phantom Canyon Preserve a couple of weeks ago with the Platte Basin Timelapse team. We were installing some new timelapse cameras in the canyon and a couple of GoPros underwater. Cool stuff. Thanks to volunteer Stan Woodring for the warning – next time I’ll pay attention. I promise. Posted in Prairie on July 24, 2013 by Dave Showalter. I’m glad your “jig and a leap” reflexes were working! Would’ve been a YouTube sensation if Forsberg was watching!